Are you looking for a no hustle bustle holiday? King Island is ready and waiting. No traffic lights to hold you up, only cows as they cross the road on the way to the milking shed. The beautiful beaches will suit the walker, swimmer, surfer, fisher and beachcomber. There is plenty of wildlife to see, and the friendly locals to fill you in on where to go and what to do. Less than an hours flying time from Melbourne, Victoria and mainland Tasmania, King Island (largest island in the Hunter Group) has a population approaching 1600 people. The main industries on the island are dairy, beef, kelp and fishing. To get around and explore, a hire car is the go. There are about 500km of roads, mostly unsealed on the island which is approx. 65km long and 30km wide. You can book on a bus tour, hire a mountain bike, or catch the solitary taxi, but there is no public transport. Airport transfers can often be arranged through your accommodation. The airport is 8km North of the main town of Currie, which is located on the West coast. The only other town is Grassy, which is on the Southeast coast, approx 22km from Currie. There are two nature reserves on King Island, covering 7200 hectares, but wildlife certainly aren't confined to them. Just being out and about you have a good chance of seeing quail, pademelons, wallabies, feral pheasants and wild turkeys. You may spot fur, elephant, and leopard seals along the coastline, or the shy platypus in freshwater bodies. So far 78 species of birds have been sited, including the endangered Orange Bellied Parrot, that visits between Autumn and Spring. A bird hide overlooks Shag Lagoon, where colour signs inform you of the 28 species of bird that have been spotted from there. You can even assist by filling out a bird observation sheet, telling what you saw, how many, and the date and time. Shag lagoon is found 1km down Heddles Road, which is 4km North of King Island Dairy. Seal Rocks State Reserve contains the spectacular cliffs at Seals Rocks, and the Calcified Forest, the petrified remains in sand dunes, of what was a forest millions of years ago. Its about a 15m walk from the car park. There are plenty of walking tracks with the booklet, "Walks of King Island" available at Currie Newsagency. King Island Wilderness Walks do guided tours catering for all levels of fitness. King Island Tours do packages with accommodation that cover photography, bird watching, shipwrecks and shore based fishing. The peace and tranquillity of the island is a contrast to the waters surrounding King Island, where sadly, around 60 ships have come to grief in the treacherous seas. The information booklet, "The King Island Maritime Trail: Shipwrecks and Safe Havens", tells many of the fascinating stories. They can also be found here. Four lighthouses still direct ships in these modern times, with Cape Wickham being the tallest in the southern hemisphere. If you would like to get under the water, King Island Dive Charters have more than 30 years experience in the area, and specialise in wreck dives. They also do fishing charters. Crayfish and abalone can be taken in season with the relevant permits. If your plan is to surf great waves, you are spoilt for choice. If the waves aren't at one beach, try another! Martha Lavinia, Phoques Bay, Red Hut Point, Porky Beach, British Admiral can all be top spots. Martha Lavinia Beach has been voted by "Tracks" magazine as the best beach wave in Australia. If all you want to get wet is a fishing line, you can go freshwater or surf fishing, or drop a line from the Naracoopta Jetty. You can get bait and tackle from Terry Perry's in Currie or The Trend (also hires mountain bikes) in Currie. If you can't catch anything, don't worry. King Island is known for its fine, fresh fare. You can even buy direct from a fishing boat at Currie harbour, be it giant crabs or crayfish, if you time it right. Apart from having great seafood, the lush pastures produce the highly sought after local beef and dairy produce. The King Island Dairy is 8km North of Currie, and open for tastings Sun-Fri, noon-4.30pm (closed Wed. May-Sept). There's the brie, and the cheddar, and the thick cream, and the yoghurt, and...! 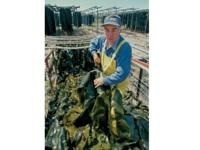 An unusual industry found on the island is the harvesting of kelp. Giant bull kelp, up to 8m, grows on the reefs around the island. It is gathered up from beaches and rocks where it has been washed ashore, and placed on racks to dry. It is then milled into granules which can be sold for livestock supplement, or a soil conditioner. Most of the harvest is sent off for processing into alginates, which are used in many products including toothpaste, icecream, paints, paper, lotions and creams. The annual harvest is around 3000 tonnes, which supplies approx. 5% of the worlds production of alginates. Kelp Industries has a visitor centre which is open weekdays. For unique souvenirs, visit King Island Kelp Craft in Grassy, who sculpt and sew kelp into great items such as hats, figurines and animals. For an overview of the island, pop into the King Island Museum which is staffed by volunteers (2pm-4pm, 7 days a week, closed July-August, small entry fee). Its located in the old lighthouse keepers cottage. The King Island Grazing Trails are a network of recreation and food trails covering five different areas of the island, advising you of places to stop and eat, walks to do, and location of toilets and bbqs. They are a great way to see the island and can be viewed here. It also lists outlets where you can buy KI produce if you decide to self cater. Put KI Bakery on the must visit list, which their gourmet pies just some of the delights. Horse rides are available with King Island Trail Rides, who have coastal and beach rides, and cater for people as young as six years old. Scenic flights are available through Ayton Aviation. King Island Golf and Bowls Club welcome visitors. The coastal views are breathtaking around the 18 hole golf course. Lawn bowls are played Thursdays and Saturdays during the summer months. Squash courts are also available. Stay tuned for news of the new 18 hole championship links course under development at Cape Wickham. The King Island Boat Club sails a variety of marine craft, and has a clubhouse with bar and bbq facilities. The remote beauty and freedom of the island with its wild coastline, yet peaceful fern lined gullies has attracted its share of artists. Portside Gallery in Grassy has local works of art and craft on exhibition and for sale, and the King Island Cultural Centre on Wharf Road, Currie is kept busy with local arts, community projects, exhibitions, and resident artists. Currie, the main town, is on the West coast and has a small fishing harbour. An online access centre is hosted by King Island Regional Development Organisation at 5 George Street. Currie has two supermarkets, a butchery and a bakery. It has a Westpac Bank and ATM, with most shops having EFTPOS facilities. Grassy, on the Southwest coast has some of the island's best views. It has a supermarket. It was previously a busy town when a nearby scheelite mine operated for 75 years, closing down in 1990. King Island has a number of places to eat out, but it pays to check opening hours. Some are shut on Sunday. King Island Coaches do 1/2 day - full day tours, and dusk tours to a penguin rookery. King Island Discovery Tours do small group tours by minibus. Island Tours have organised bus tours, hire cars, and also foot tours. Please note that only Telstra Next G mobiles phones work on the island. Mobile phone rental is available at the airport shop. Car Rental available through Cheapa Island Car Rentals, King Island Car Rental and P and A Car Rental. 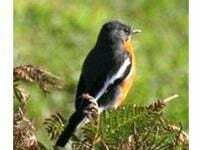 Photo Credits: Orange Bellied Parrot, courtesy King Island Tours; Loch Leven Wreck site, courtesy Tourism Tasmania and Southern Cross Television; big wave surfing, courtesy King Island Tours; kelp harvesting, courtesy Tourism Tasmania and Joe Shemesh; horseriding, courtesy King Island Trail Rides; Currie harbour, courtesy Tourism Tasmania and Dennis Harding.